The difference between acidic and non-acidic (alkaline) foods is the single most important thing you can learn if you want to get into canning. Learn the difference, and you'll preserve jars of fabulous seasonal, local food that you can serve up even in winter. Get this wrong, and, well, it gets scary (botulism, anyone?). Foods with a PH towards acidic can be safely processed in a boiling water bath. A boiling water bath doesn't require any special equipment. The acidic foods that can be processed in a boiling water bath include fruits and pickled vegetables (including relishes and chutneys). Here are some specific examples: plain fruit, with or without syrup, can be safely processed in a boiling water bath. Green beans pickled in a vinegar brine are safe to can in a boiling water bath, but plain green beans in water must ​be processed in a pressure canner. Tomatoes are in the safe-to-process-in-a-boiling-water-bath category, too, but may need an extra shot of vinegar or lemon juice for acidity (see note below). Alkaline foods, including all plain (i.e. not pickled) vegetables and all animal products, must be processed in a pressure canner. This translates to plain veggies in water, soup stocks (including vegetable stock) and any animal product. Pickled green beans, for example, are fine to process in a boiling water bath. But plain, unpickled green beans must be processed in a pressure canner. How a pressure canner makes non-acidic preserved foods safe: The reason that some foods can be processed in a boiling water bath and others require a pressure canner is that botulism can't survive in an acidic environment, e.g. pickled green beans, but it can survive the temperature of boiling water. So canning unpickled plain green beans in a boiling water bath doesn't guarantee they're safe. But a pressure canner heats the food to hotter than the temperature of boiling water and kills off anything scary. A pressure canner is a specialized piece of equipment that includes a pressure gauge, closeable vent, and other things you can't duplicate with a big pot and a lid. I recommend All-American Pressure canners, but there are several good brands available. The simple, safe way to remember this is that all fruits, pickled vegetables (including chutneys), jellies and jams can be safely processed in a boiling water bath. 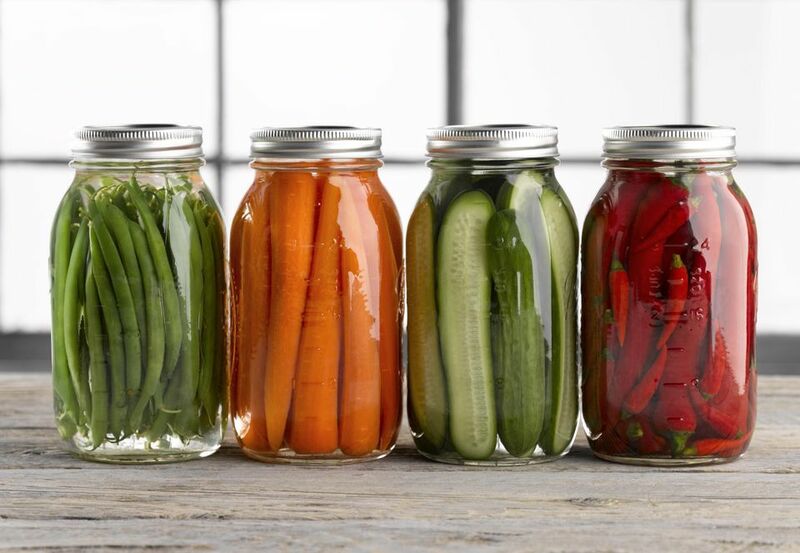 All animal products and unpickled vegetables, including soup stocks, must be processed in a pressure canner. Important Note About Canning Tomatoes: It used to be tomatoes were acidic enough to process in a boiling water bath, no questions asked. But growers have spent decades breeding sweet-tasting tomatoes that have lower acidity. Some of these low-acid tomatoes are not safe to process in a boiling water bath unless you up their acidity by adding lemon juice, vinegar, or citric acid. I usually play it safe and add one of these to my tomatoes even if I suspect I might be canning an old fashioned, high acid variety. Why risk it? Add 1 tablespoon bottled lemon juice (fresh varies in acidity, so don't use it) or vinegar per pint of tomatoes, or ¼ teaspoon citric acid per pint.